I would say these are useful but to be honest we never got one because we figured we would just change Junior on the floor until we got a table and we liked the floor option. Once the child starts rolling then it’s definitely safer to change on the floor. We just put a towel and a change mat on the floor and that worked fine. When: If you’re going to get one then you should have it when the baby is born. Cost: I saw a nice one at Sears that had a couple of shelves underneath for $129. You need one for the diaper bag one for changing diapers at home regardless of where you change them. You put it on top of whatever you’re changing the baby on and then put the baby on the change mat. Dresser – I saw an ad recently for a used crib set which included a crib, mattress, cradle, change table, dresser (matches the crib), valance and wall hangings (what the hell are these for?) which they paid over $2300 for new and were now asking $600. All I can say is that a dresser is necessary because you will end up with quite a few baby clothes and will need a place to store them, but the condition, age and colour of said dresser doesn’t matter at all. We used a simple dresser that I had purchased in university for $20. It has been repainted a couple of times but it works just fine and looks great, even if it doesn’t match the crib. When: Ideally you should have one by the time the baby is born, but you can get away without one for a while. Cost: $100 at Zellers. You can spend a lot more if you want, especially if it’s part of a fancy set. You need this for feeding the little girl/guy. Normally they don’t start eating regular food before about 5-6 months but we started to put our guy in it around 3 months so that he could hang out with us at meal time. This is a seat you strap onto a normal chair so that Junior can sit at the table with you if you don’t have your high chair handy. We got one of these when Junior was about 7 months. They are pretty useful if you are going out somewhere and want to feed him (ie a relatives/friends house). Also good if you have visiting babies who are hungry and need a place to sit. When: Six months or later. These will be essential once the baby starts to get mobile which is normally around 7-12 months. From the time our baby starting being able to move around a little bit, it took about a month before he could crawl so we had lots of time to think about baby gates. There are different types of gates – the best type is where you screw the hardware in to the wall/trim and attach the gate. This type is mandatory for the top of the stairs. There will be a bit of damage to your walls/trim but that’s nothing compared to the damage the kid will do when they get older. You can probably install one of these in about an hour or so. Another type of gate we have doesn’t screw into the wall but instead has four bolts that can be adjusted to get the gate to stay up. The last type we have which we didn’t use was a sliding plastic gate. You are supposed to put the gate in the doorway, open it up until the pressure holds it in place and then lock it in position. This might work in a house where the door frames are approximately 90 degrees but in our 90 year old house it was useless. When: Probably not before six months and sometimes well after that. I would wait until the kid starts to move a bit before worrying about these. They do get in your way so there is no point in putting them up before you need them. This also applies to the baby proofing. Don’t stress out about this, you will have plenty of time to prepare an area of the house so it’s safe for baby and you can relax and watch them play. Don’t try to proof the whole house – impossible. Costs: $70 at Ikea – very nice ones. We used five in our house, but the number you will need is dependent on the house configuration as well as how much of your house you want to baby proof. Mike, I’ve been following these baby posts with fond memories of loading up on stuff when my kids were babies. I was fortunate that my wife’s older sister had pretty well everything that she could give us from cribs to clothes. We gladly took whatever we could get our hands on. Let me tell you now that my kids are in college, this stuff is chump change! 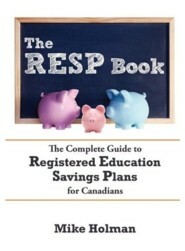 Load up on the RESP’s, the cost of college makes me long for baby expenses. Thanks for the comment Boca. I would actually advise against a changing table even more strongly than you did, Mike. I have had two friends who turned their backs for split seconds only to have a newborn roll off (without any harm in both cases, except taking years of the parents’ lives). It is far safer and easier just to change on a mat on the floor, even for a newborn. Baby gates can be tremendously expensive if you have “odd” shapes in the house, and it’s well worth considering long before you need them so you aren’t forced into buying something more expensive than you’d like. We ended up just putting a large plastic fence around one hard-to-fit staircase rather than drop $200+ on a custom staircase to fit the odd angles. I couldn’t agree more BB. I personally found it more convenient to change him on the floor because then you can do it anywhere. Staircases can be troublesome especially if they are extra wide. Oh, good. I have a house full of extra wide stairs. Excellent. Plastic fencing, eh? I’ll look into that. Thanks Brip Blap. I have to say that the booster seat is something I already have my eye on. We have friends who have one that straps into a chair or sits on the floor, has an optional tray to fit over it, and comes apart and fits in the dishwasher. They love it. I’m really hoping they don’t have another kid anytime soon, as their current one will have outgrown it by the time I want to borrow it. I’m going to comment on a really really old post to suggest the IKEA high chair. It is about $25, and is far better than most high chairs because the smooth design doesn’t trap food. When you wipe it down six or more times a day, that matters … a lot. And when the tray becomes stained or worn you can buy a new one for $5. You can also remove the tray and sit the child at the table to eat with the family. The legs come off for storage.